A rescue team arrives at the scene of an accident in Laos. Photo: Courtesy of the Rescue Service. A family of three on a motor bike swerved wildly around the waiting cars, passing only 20 centimeters in front of my heavy car. I narrowly avoided slamming into them. Nonetheless the woman turned and glared at me. For a less alert driver in Laos' capital, Vientiane, it is easy to live up to her glare. The impatient man at least wore a helmet; the woman with a 3-year-old child standing on her left thigh, did not. Laos is famous for being the most bombed county on earth. Each year people are blown to bits or have bits blown off them by unexploded ordnance (UXO) left by the Americans. But in 2013 official figures put UXO deaths at 60, while at least 786 died in road crashes. "We don't have data," says 37-year-old French paramedic Sebastien Perret, founder of Vientiane's volunteer Rescue Service. "If they die immediately or on the way to hospital they are counted as road fatality. If they die two days later from injuries, they are not." 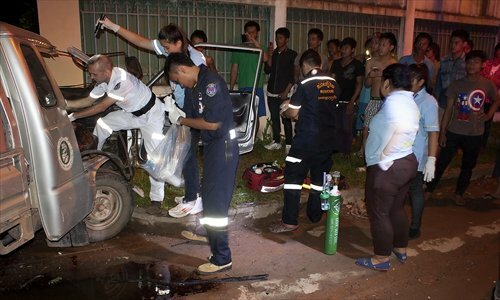 The sound of ambulances taking the injured to hospital is now part of Vientiane's backbuzz. Rapid motorization with undisciplined realization of speed, indifferent policing, and a drinking culture are killing young Lao, in particular. Perret looks exhausted. He has the gray hollowed outlook of a man working far too hard and caring too much. "I'll tell you a story of a miracle. In 2007 a Thai temple gave the Foundation for Assisting the Poor an ambulance, lighting the first spark of Vientiane Rescue. We shared the ambulance with a local hospital, as we had no operating capital. In 2010 Ford gave us a brand new ambulance. With a little confidence we decide to launch the first 24/7 free rescue service in Laos. In 2011 we saved more than 1,000 lives." "That all stopped when Laos Red Cross took over our ambulance. The ambulance sat parked for seven months. Our emergency phone kept ringing non-stop. We could do nothing. We thought our free emergency service would be supported especially here where nothing is free, even for the very poor." "We thought there would be an explosion of generosity, but we were wrong. Despite the multitude of well funded projects and people dying on the roads, nobody funded our activities. People with big salaries were not interested in a team of volunteers; our volunteers began to desert." "But small people gave small money, so now we have four ambulances and four specialized teams - The Paramedics for life threatening situations, Fire Rescue for burns cases. Scuba Rescue retrieves drowning victims. The Hydraulic Team frees victims in crushed cars." In November we got 143 calls, helping more than 250 victims. Figures are increasing every month. Festival times are hell. "Sometimes we cannot buy fuel." "Seventy to 90 percent of the accidents we attend to are very serious and 10 percent die at the scene. When I was a paramedic in France, only 2-3 percent of the accidents were serious." "Alcohol and speed are the major killers ….. and no driver education. Only 20 percent of the kids on the road have licenses. Roads in Laos are made for accidents. Roundabouts are too small and infrequent. Roads need to be curved to cut speed. We need more speed humps. People ignore traffic lights even when there are police, and at night they don't care. KoLao, the major manufacturer of motorbikes, refused to fund us." The manager of Europcar (rental) said, "Lao people are not my business, I get nothing back. The same goes with The Pizza Company, the Asia Development Bank, and the World Bank. All the rich ones give us nothing." Later a siren makes me turn to see an old refitted pickup edge its way through the compacted traffic. Who trains the Rescue drivers? Perret shrugs. "They have to learn on their own. The police teach road safety in schools, but they have caused deaths. Last month two young guys on a motorbike were killed while being pulled over by police." "The hospitals in Laos are badly equipped. We were called when a man was dying, drowning in his own blood. They didn't have basic suction equipment, and we do. We saved his life but …" he shrugs. "That a man can drown in his own blood after 30 years of development? What is going on?" "But after the ABC TV made a documentary, the Australian Embassy gave us $16,000." "Our volunteers are aged between 16 and 30 and ideally should have five or six months' training before they go out, but we cannot afford that luxury. They are gentle and caring and highly motivated. I train them in fracture immobilization, cardiac arrest, airway management. We are the only ones certified by the Thai National Emergency Medicine Institute." "We could save more lives if we used morphine and intravenous infusions to manage shock, but the Ministry of Health says no. But I can tell if the patient is rich, as they scream. The poor suffer quietly." A sardonic smile. "Helmets save lives. Those not wearing helmets usually die while those wearing them, even with fractures, will leave the hospital in a few days and helmets reduce head injury. If police found drunk drivers and confiscated their cars or motorbikes, no matter how rich or poor, that would change things." Six months ago a woman called. Her husband had crashed 38 kilometers out of town. We searched until we finally found him in a ditch. He complained of severe neck pain. A broken neck is a big deal for a well equipped team, much less a 25-year-old ambulance on a bad road. We immobilized his head and neck and lifted him gently. He cried. Later I understood why he was crying. It was not about the pain, but because he was touched that we came to pick him up, touched that we didn't expect any payment, touched because we were gentle. So many people die on the roads, but sometimes miracles happen. That was a miracle. He walked out of hospital.